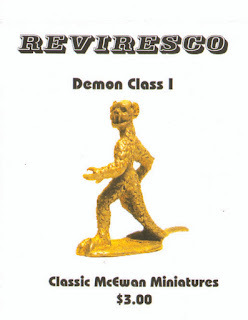 Over the summer, Reviresco brought the old school McEwan Miniatures line of 25mm (and 28mm) fantasy miniatures back into production. I purchased a few of the 25mm figures hoping that they were similar in size to their 25mm Starguard figures. This post is a short review of the miniatures that I received. 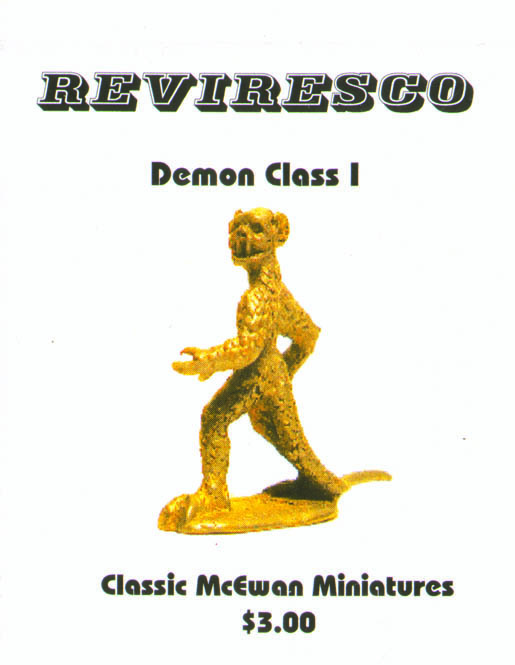 The first figures are of a Demon Class I and an Evil Priest. The Evil Priest is sold as part of the Evil Priest & Sacrifice set, which consists of the former Evil High Priest (Heros and Wizards WZ-11), and Alter [sic] of Chaos with Sacrifice (Fantasy Items AS-22). The Evil Priest has the look of an Egyptian priest, and perhaps was modeled after Thoth-amon from the Conan stories by REH. The demon is not the Type I Demon of AD&D, but I like it because it is not much bigger than a human, which is how demons are often pictured in medieval illustrations. The next miniatures are a Sphinx Female and a Sphinx Male. These are not colossal sphinxes like stone monuments, but they are of a size that reflect figures shown on ancient Greek pottery. They also look like they may have been modeled after the gynosphinx and androsphinx illustrated in the AD&D Monster Manual. The final figures are from the Armored Goblins set. These figures were previously called Lesser Orcs (Heros and Wizards WZ-10). The set consists of six figures in two poses with shields and a mix of swords. The figures appear to represent goblins (orcs) of Isengard based on the symbol depicted on their shields. They also remind me a lot of the old Citadel Red Orcs. The McEwan figures match up very well with 1/72 figures. They are obviously crude in comparison to modern figures, but I still like them a lot. I wouldn't say it is due to nostalgia, since I wasn't even aware of these figures when I first started playing FRPGs. Perhaps it is their simplicity that makes me use my imagination to fill in the details when I look at them that makes them appealing. Who knows? I plan on getting more figures from the line, and if others are interested, Reviresco is currently having a 20% off sale until Dec. 15 2017. Hi! Great news, I was looking for a sphinx (or two :)) for a 1/72 HOTT Egyptian army, I am going to look at these. Thank you ! If you like smaller sphinxes, you can also look at the old Grenadier Fantasy Lords sphinx from the Monsters of Mythology box set. They often show up on ebay, and I think that Mirliton still sells them as well. The evil high priest is a 6-footer for sure, and I'm happy to use him for Thoth-Amon who is described as being tall in the Conan books. I bought some additional miniatures during their sale, so I will post pictures of more human figures in the new year.